Apparently someone has hacked into the New York grid...from our friends over at Gothamist.. Okay, Daryl explained things...I wondered why someone would put such a statement on a sign. I'm afraid closed up/empty stores is a sign of the times everywhere. It can be downright depressing. I personally don't feel New York is dying, but much of its old charm is clearly dead and gone. I agree with you Ken. I too am not happy with how things have changed in New York City, but I think most of the people that remain have great spirit. It's just sad that many of the people that used to live in Manhattan can no longer afford to do so. If I hadn't moved here in 1990 and found a cheap rent controlled apartment, I would have never been able to live here now! Great pic, but how depressing! Hellooooo down there. Don't you wonder who posted the sign??? I think this happened many years ago with the LA freeway signs. WHat a great capture! What's really sad...no one active now KNEW New York. They are mourning the passing of the punk amusement park of the 70s and 80s...a New York that was already fallen and broken. They learned to expect this of the city and so when they get there and find it a chain-store mecca that's cleaner and safer, they're let down by the cleanliness and safety as much as by the chain stores. Another thing wrong: Nobody here now does anything but work. That used to be a lot different, but again, nobody kows it now. Frank forgets to mention that the city remained relatively unchanged, architecturally, from the late 70s to the late 90s. First, the old Times Sq movie theaters and surrounding midtown area fell, then 9/11 ushered in a building boom unseen round here since probably the early 70s. But he's right, chain stores are everywhere now. I remember when the first MCdonalds appeared on West 3rd street, I couldn't believe it. Oh, I forgot, nobody knows nothing. Guess what? NEW YORK IS DYING, and maybe even dead already. I'm a born and raised New Yorker. And now the city has become nothing but a big shopping mall and tourist attraction. Are you kidding me? There's no more edge or excitement here anymore, everything has been sanitized, Thanks Guiliani and Bloomberg!! They sold out our city. All they cared about was the folks with money and these damned tourists. And don't think I forgot about all you transplants coming from Iowa, or Michigan or whatever freaking state you come from. What, you come here, live here 10 years and think you're a New Yorker!?? You too killed this city. Nobody wants you here, you and the freaking tourists! are you kidding me? and until now you realize this? 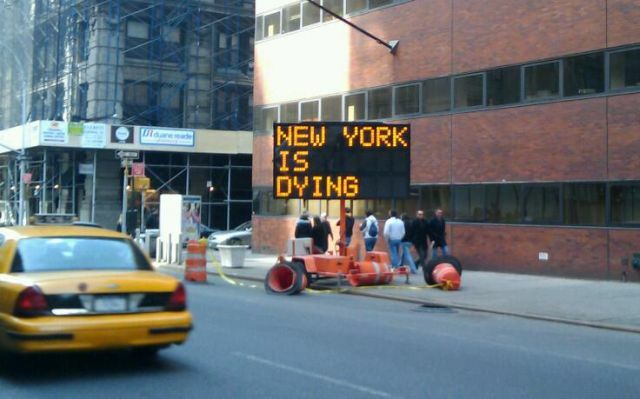 NYC is diying a long time ago, all the people in the town know it.